Almost every morning, I start the day with an experiment on flow in porous media. First, I generate some fine-grained sediment with a well-defined average grain size and proper sorting; then I use that sediment to fill a little basin of sort and try to mimic compaction. Finally, I use a machine to put water under pressure and force it to flow through this miniature sedimentary basin. Then I sit down to drink the fluid which is not simple water anymore, due to its interaction with the grains; and its taste and consistency tell me whether I got the grain size and the porosity right. That's a geologist's view of making espresso. Unless you have a fully automated and ultra-expensive espresso machine, creating a high-quality caffeine concoction is not trivial, because the water must have the right temperature and has to spend the right amount of time in contact with the coffee grains that have the right size. The right temperature is 85–95 °C (185–203 °F), and, at least with our simple machine, the trick is to start the brewing at the right time. Better espresso machines do not use steam to generate pressure because that makes the water too hot; instead, they have a motor-driven pump that generates the ~9 bars of pressure. The correct grain size is easily achieved with a burr grinder (as opposed to a simple blender); a good espresso grind is a fine grind, because the water spends relatively little time in contact with the grains. The duration of this contact is the most difficult bit to get right. To get a good shot with lots of crema, it cannot be less or more than 20 to 30 seconds. Not just grain size, but grain sorting as well play a role. If the coffee grinder produces a poorly sorted 'sediment' (and that's what a blender does), the coffee will not be porous and permeable enough. Another factor is how well the sediment is compacted; that is, how much pressure do you apply to the coffee during tamping. This affects permeability again. Finally, it matters how much coffee you put in the coffee holder; the thicker the layer that the water has to go through, the longer the trip becomes for the same amount of water. After using the machine hundreds of times, I still manage from time to time to produce something undrinkable. The art and science of espresso making started to make more sense once I started to think of it in terms of Darcy's Law. where K = hydraulic conductivity, k = permeability, ρ = fluid density, and μ is the dynamic viscosity. In coffee speak, the hydraulic head is given by the pressure generated by the machine, and is fixed; one cannot change the density and viscosity of water either. The most important variable is coffee permeability, which is influenced by size, sorting, and packing (compaction) of the coffee grains. Also, it helps if you get the value of L right, that is, you shouldn't try to save coffee. 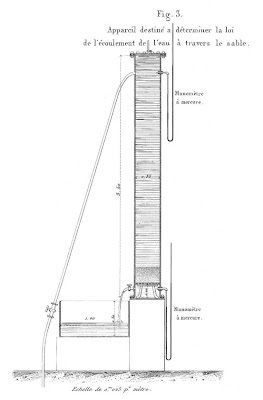 Darcy's Law was established with some simple experiments, and it has since then been generalized and derived from the Navier-Stokes equations, but it has a huge range of applicability, from ground-water hydrology to soil physics and petroleum engineering. Add to that list everyday espresso making. ps. Fantastic resource on Darcy's work and his law here. Our Christmas gift to ourselves was a little trip to the Big Island of Hawaii, something we were thinking (dreaming) about for a long time. 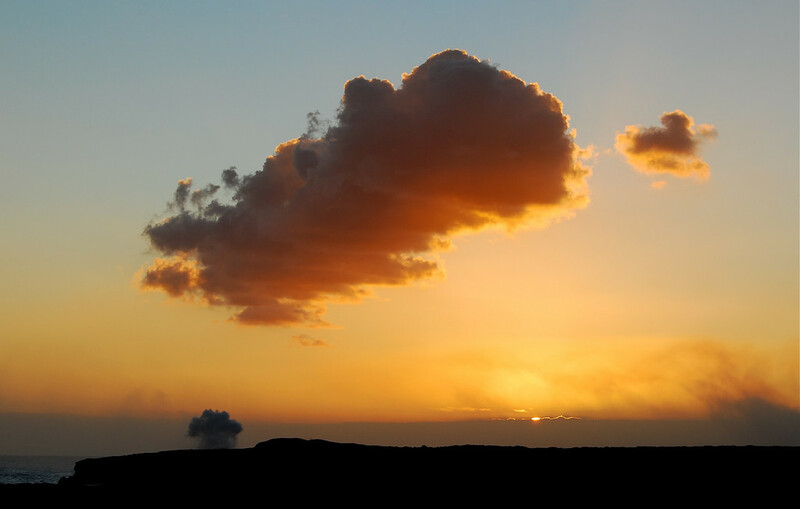 There are many great posts about the Hawaiian volcanoes on the geoblogosphere (see for example the ones here and here); I will try to add a few notes and pictures without being too repetitive (and will try to seem less ignorant in volcanic and hard-rock matters than I actually am). That was a bit of a disappointment, but I knew I had to give it another try. 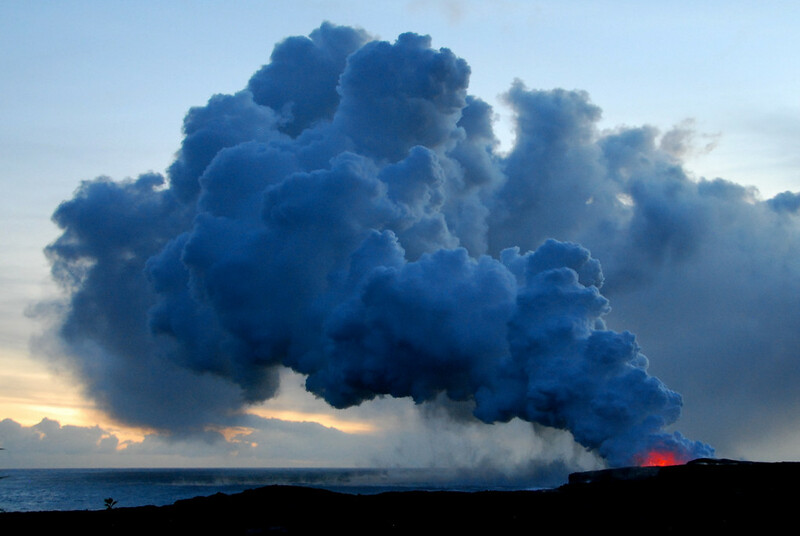 After talking to a ranger from Volcanoes National Park, we drove back to Kalapana five days later. This time, the show was definitely on. More than that, it was spectacular. 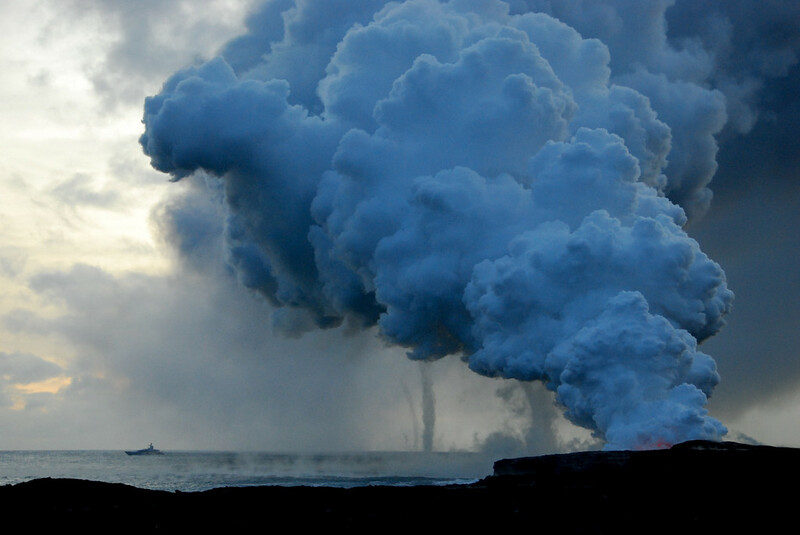 A huge column of steam formed where the active lava tube spills the lava into the sea, and repeated explosions painted red the lower part of the column. 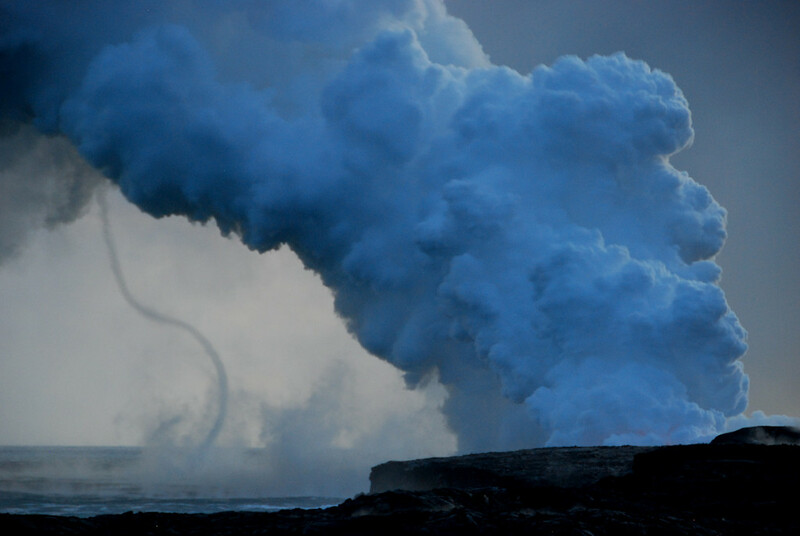 From time to time, several tornado-like funnels formed and connected the steam cloud to the ocean. This was such a uniquely beautiful scene. 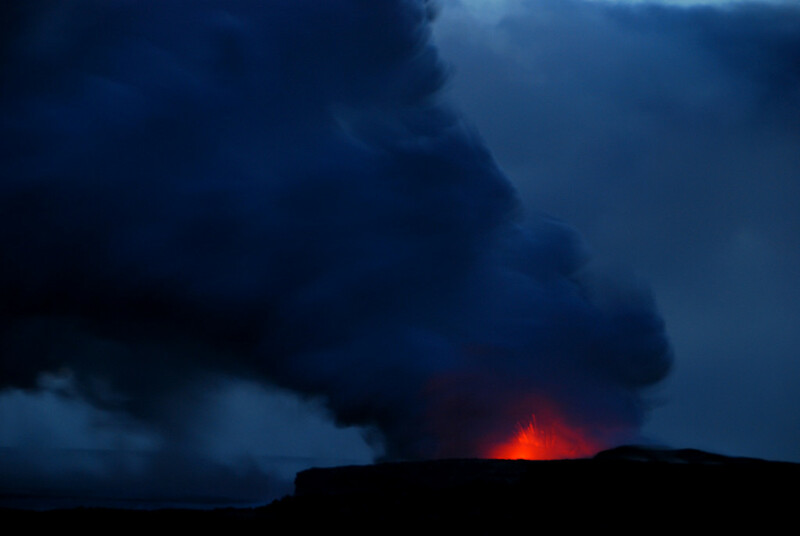 I wish we went there more than two times, because the whole spectacle changes as a function of the activity of lava flow, weather conditions, the direction and nature of lighting.